MLB 4 Ball & Divot Tool Tin Gift Set (Click For Info On Available Teams) - $24.95 - GolfersEdgeOnline.com - Best Golf Equipment On The Web! 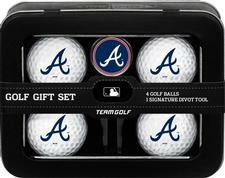 Display your team pride by hitting the links with a 4-Ball Tin Set. 4 regulation golf balls feature boldly imprinted team logos, which allow you to show your athletic allegiance from tee to green. An ergonomically-designed divot too with magnetic ball marker allows for superior functionality as you step to the big putt. A stylish collector's tin equips the Team Golf 4-Ball Tin Set with remarkable quality. If you have any more questions about the MLB 4 Ball & Divot Tool Tin Gift Set (Click For Info On Available Teams); do not see the model you are looking for; need custom options; or prefer to not purchase online, then please call us at (630) 656-1291.